Motorola’s budget Moto G has grown up, but does a better camera, waterproofing and new features justify a more costly price tag? The original Moto G redefined what a budget smartphone should be, when it launched in 2013. It was the first Android phone under £150 that wasn’t slow and infuriating to use, and it didn’t skimp where it matters. Fast forward two years and the third generation Moto G provides much of what the original did right. But as smartphone technology has improved so has budget hardware. Where the Moto G stood alone as a beacon of good in a sea of rubbish, there are many more worth buying today. So Motorola has pushed improved features, build quality and battery life, but in doing so it pushed the price to the very edge of the budget market. 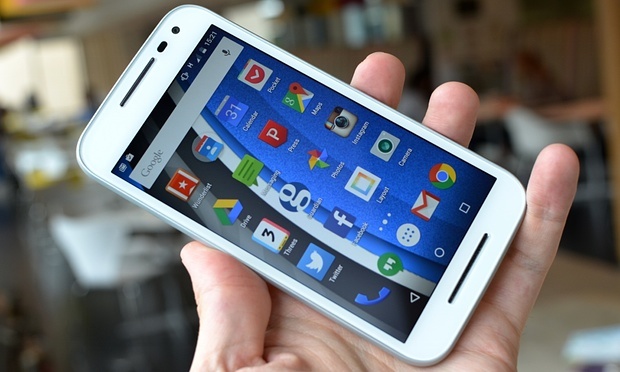 The Moto G’s design has been refined and takes after Motorola’s Moto X andNexus 6 phones. The glass screen is surrounded by metal-like plastic. The back now has a removable ribbed, curved plastic back and a silver metal bar that holds the camera. It’s a simple design that’s easy to hold and won’t slip out of the hand. The build quality is also noticeably improved over last year’s model. Waterproofing to IP67 standards means drops into 1m deep water for 30 minutes aren’t an issue, while a removable back hides a microSD card slot for more storage, but not a removable battery. The curved back and sides are ergonomic, but at 11.6mm thick the phone is quite chunky by today’s sub-10mm standards. It isn’t noticeable in the hand, however. The Moto G’s 5in screen has a resolution of 720p HD with a pixel density of 294 pixels per inch. It is noticeably crisper than the lower resolution Moto E, but not as sharp as more expensive smartphones with 1080p or higher resolution screens, such as the OnePlus One, Samsung Galaxy S6 or LG G4. · The third generation Moto G has an upgraded 1.4GHz quad-core Snapdragon 410 and a choice of 1GB or 2GB of RAM depending on the storage variant. · The version with 16GB of storage and 2GB of RAM, as tested, feels slightly snappier than the previous generation Moto G, and is easily on par with all but the very fastest of smartphones. · The multitasking menu, which brings up a stack of cards showing previously used applications, is particularly snappy – something even smartphones costing £500 or more struggle with. · The Moto G consistently lasted one full day of use up at 7am with around 25% of battery left by 10pm in my testing, with constant push email, lots of notifications, 60 minutes of music playback over Bluetooth, 1.5 hours of browsing and a bit of light gaming. · Lighter usage should see the Moto G easily through two days between charges. The Moto G comes pre-loaded with Google’s latest version of Android 5.1.1 Lollipop, which is a refined, easy to use and attractive mobile operating system. Motorola also provides a few of its apps, which can either be used or replaced with others from Google or third-party developers. Of note is Moto actions which allow users to set up automated tasks such as silencing their phone when they get home or while in meetings, or motion controlled gestures such as a karate chop, which turns on the flash for a torch. All work well. Motorola’s Migrate utility also helps switch from an iPhone, transferring contacts and calendar entries as well as almost everything from another Android phone. The Moto G’s camera is much improved over last year’s model. The 13-megapixel camera is the same as used in the Nexus 6 and produces decent images with good detail, colour and good low-light performance. It is considerably better than most of the competition. The five-megapixel selfie camera is solid, producing decent photos for viewing on the phone. The photos lack detail at full resolution, however. The simple Motorola camera app can be rapidly activated by a twisting gesture even when the phone is locked. Unlike most other camera applications, by default tapping the screen takes a photo rather than focusing. Holding down the screen activates burst fire, while sliding out from the left displays options and from the right the gallery. It’s simple and works well most of the time, although occasionally it would miss what I was trying to focus on. Manual focus and exposure controls are available, but better third-party camera apps exist such as Google’s Camera app. The third generation Moto G costs £159 for 8GB and £209 for the 16GB version with 2GB of RAM. The Moto G can also be customised using Motorola’s Moto Maker, to change the phone’s back, front and side colours starting at £179. The third generation Moto G is the best yet. The build quality is excellent, the screen decent, the phone’s performance snappy, and the camera is solid. It feels great in the hand and the ribbed back makes it easy to grip. The battery life is also solid and waterproofing means it’ll survive a trip down the toilet. Not many Android phones come with screens as small as 5in, meaning the Moto G is arguably one of the best. The biggest problem is the price. The 16GB version with the 2GB of RAM is recommended, but at £209 it is no longer very cheap, verging into the price range of the likes of the OnePlus One. Hopefully, like previous versions, it will drop in cost from third-party retailers soon. As it stands the Moto G is arguably still the best budget smartphone available, even if it’s not quite as cheap as it used to be.